Republican Sen. Lisa Murkowski claimed on the Senate floor Friday that Alaska has the highest unemployment rate in the country. “I come from a state where we’ve got the highest unemployment rate in the country right now,” said Murkowski. Alaska had an unemployment rate of 6.3 percent in November, the highest of any state, according to the Bureau of Labor Statistics. Murkowski and a number of other senators took to the Senate floor Friday to discuss the partial government shutdown. She claimed that due to her state’s high unemployment rate, those furloughed or working without pay in Alaska will not be able to easily get a temporary, second job in the interim. The New York Times found that Alaska has the most federal employees affected by the shutdown per capita in the country. “We are more reliant on the federal government for our economy than most states are,” Neal Fried, an economist at the Alaska Department of Labor and Workforce Development, told The Daily Caller News Foundation. 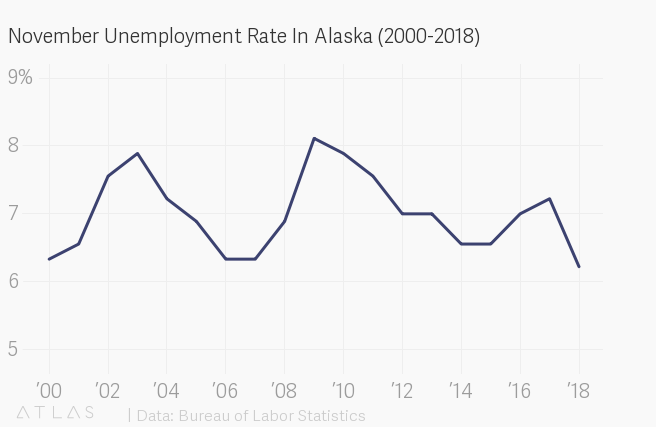 Alaska did have the highest rate of unemployment in the country at 6.3 percent as of November – the latest month for which data is available – followed by the District of Columbia, which had an unemployment rate of 5.6 percent. The national average was 3.7 percent that month, with Hawaii and Iowa tied for the lowest rate at 2.4 percent. While Alaska’s unemployment rate is the highest in the country, it has fallen from 7.3 percent in January 2018. Unemployment rates peaked at 8 percent from August 2009 to April 2010. Fried also noted that high unemployment rates among some of Alaska’s more isolated, rural towns and villages were partially responsible. Oil prices deeply affect Alaska’s economy and contribute to fluctuations in the state’s unemployment rate. The oil and gas industry is by far the largest in Alaska, with nearly 85 percent of Alaska’s state budget coming from oil revenue at one point. When oil prices plunged in recent years, Alaska fell into a recession and unemployment rose. Higher oil prices since then have helped to bring the unemployment rate back down. Outside of oil and gas, tourism and fishing are also important Alaskan industries.